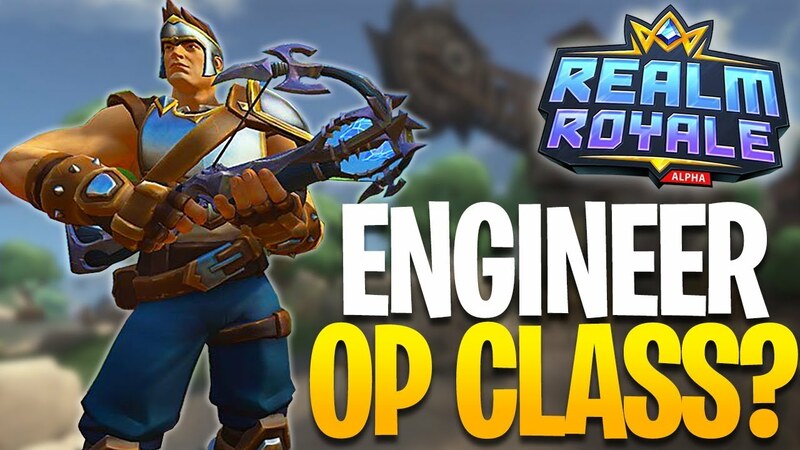 Realm Royale Engineer Class Guide – Tips, Abilities, Builds, Legendary Weapon. Construct totems and put down bulletproof barriers with the Engineer class in Realm Royale! Our Realm Royale Engineer class guide will run you through all of the class’s abilities, builds, legendary weapon, and some tips to get ahead as the shadow based Assassin! With Realm Royale just out and a lot of people taking the plunge and trying it, we decided it’d be good to take a look at all of the classes and how they differ. Engineer gains 5 Armor per second as their passive. This is a pretty strong passive, it allows you to gain your armor back during a fight or if you are lacking potions. The Engineer class focuses mostly around the Turret that can do small bits of damage that add up quickly. It’s a good support class for the team, you can barricade off an area or heal the whole team with your totem. Thrust: Jet upwards into the air. Pretty good for getting to high areas to potentially setup a turret, but leaves you super vulnerable to anyone with hitscan weapons. Barricade: Deploy a shield that blocks enemy shots. Works really well with the turret or if you are looking to escape. Deploy Turret: Deploy up to 2 turrets that shoot enemies. Pretty good at annoying people and softening people up for your weapons. Fire Bomb: Throw a bomb that leaves a pool of fire. Fairly strong skill, does an initial bit of damage than deals damage in an area. Good for tight quarters. Healing Totem: Deploy a totem that heals allies. Decent in the early game if you are missing potions, but not so good in the mid-end game. This should be a pretty obvious strategy! Put down a barricade and lay down the turret which will protect it quite nicely. This is a nice strategy for Forge areas where people will be forced to come to you. The turrets and barricade basically locks out enemies from certain areas and forces them to take alternative paths. Fire Bomb is a pretty strong ability, you can deal quite a bit of damage with it by just landing it on the target plus the additional damage if an opponent is running through it. Barricade allows you to prevent any incoming shots, so if you get into close to mid-range fights you can play more out in the open with the backup of your Barricade in your pocket. Plasma Launcher (Engineer): 800 Damage, 1.0 Shot per second. To go along with the splash damage of the Fire Bomb the Engineer also has the Legendary Plasma Launcher. If you land a direct hit with it to an opponent you will deal 800 damage. If you miss and the damage splashes it does 400 damage. This is a good weapon for people who might struggle a bit with their aim. The splash is fairly minimal, but it does work nicely to enemies hiding behind walls. You can spam this to the edge of where they are hiding and get damage on them. The Plasma Launcher doesn’t shoot very far and arcs downwards after a short distance. You’d be best off either keeping fights close or using a longer range weapon to compensate for it. Here are some general tips that should help you get better with the Engineer class. Thrust can allow you to get high ground in areas where classes like Assassin and Hunter can’t. Be sure to take advantage of this if you are against these classes. You can still fire shots while using Thrust, so be sure to do this. Most other movement skills can’t fire weapons while being used. Try to use your turret to take fire off yourself. It can be easy to kill, but you can then use it as a way to flank around or fire from different areas. Barricade prevents any shots from coming through, this can be utilized in close range fights. You can run through it if they get on the other side of it. Fire Bomb can be good to keep track of enemies. If they attempt to run through the flames you can see the damage being done through walls.